Unique to the four paintings Dempsey Essick did of the Two Meeting Street Inn in Charleston, S.C. is the beautiful blue willow pot which held a hydrangea plant. That arrangement is now the subject of a Pinkie Print entitled “The Charleston Touch”. 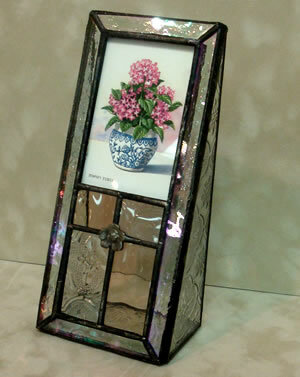 Framed in an antique-style stained glass frame this is the most beautiful of our thumbnail prints.